SINN FÉIN has said it won’t take lectures from the under-performing Health Minister Michael McGimpsey, who has accused critics of the state of the health service in the North of playing politics. The health minister refused to attend yesterday’s North/South Ministerial Council where health and all-Ireland co-operation in the recession dominated the agenda. FIANNA FÁIL TD Noel O’Flynn has accepted a challenge to debate the Government’s attitude to youth unemployment after five Ógra Shinn Féin activists staged a two-hour roof-top protest on his constituency office in Cork on Tuesday morning. BELFAST: Eyewitness accounts of Gaza Flotilla Massacre by ex-US Marine Ken O’Keefe (who was on the MV Mavi Marmara and clashed with Israeli commandos) and Fiachra Ó Luain. Thursday 7:30pm, O’Donnell’s CLCG, Whiterock Road. Talk free, social £5 or £3 unwaged/concessions. All proceeds to Gaza Freedom Flotilla. SINN FÉIN Dublin North-East Councillor Larry O'Toole was ordered to leave the monthly meeting of Dublin City Council yesterday evening (Monday) after he protested over the refusal of Fine Gael Lord Mayor Gerry Breen to accept a motion designed to save three City Council swimming pools threatened with closure. You can now view the An Phoblacht Archives from 1997-2010 here. SINN FÉIN says it will resist the selling off by the Fianna Fáil/Green Party Government of state enterprises. THE Fianna Fáil/Green Party Government is being challenged as to whether its long-promised jobs strategy actually exists. 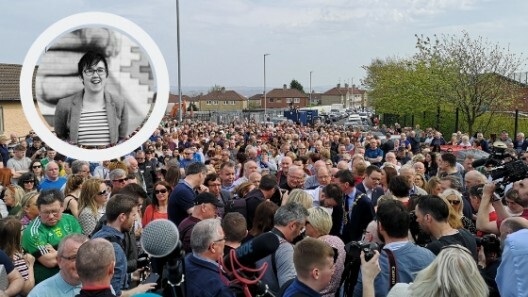 A SERIES of events will take place across Belfast from July 8-10 to mark the 29th anniversary of the death on hunger strike of IRA Volunteer Joe McDonnell in the H-blocks of Long Kesh. 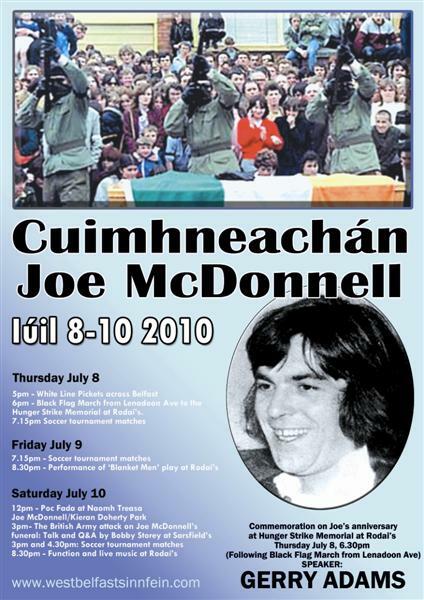 Joe passed away after 61 days and was the fifth man to die in the 1981 Hunger Strike.